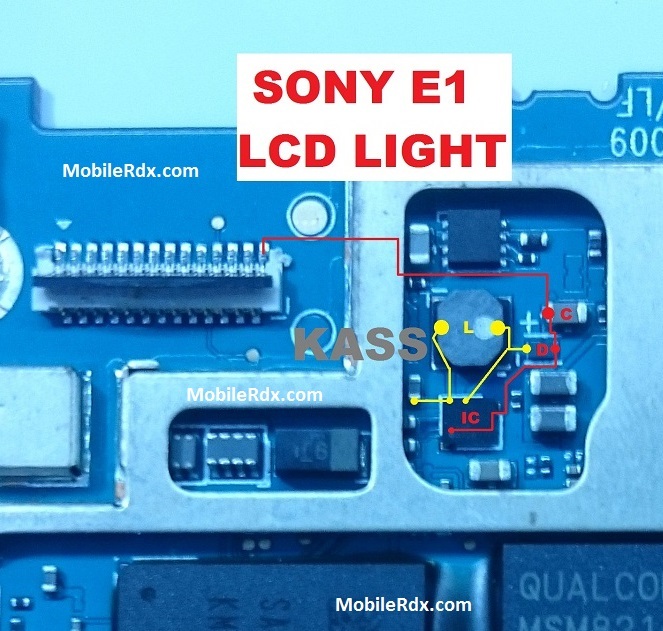 This solution covers for hardware level of repair for Sony Xperia E1 Display Problem and Also you will find Sony E1 Display Ways and Jumpers information in the diagrams in this article. Just see the solution preview below for it shows which components need to be check and replace if the there is No Display Working on phone or Display problem of the Sony Xperia E1 goes wrong. This solution may help if you already did a software calibration method and tried replacing the Display but the problem continues. After removing the case of Sony Xperia E1, the very first thing that you need to do is to unplug, clean and re-plug onboard display connector and check. Clean display connector in the similar way you did onboard connector. Now check your entire motherboard for any traces of water damage, in case you find moisture on any part of the board clean it with the help of the cotton cloth. Besides that, you can also use a blow dryer for few seconds in order to completely eliminate moisture from your phone. If the above-mentioned steps don’t work for you then re-solder onboard display connector pins, as sometimes the pins become dry solder and cause different problems. The above-mentioned steps will surely help you to resolve all of your Sony Xperia E1 Display screen problems, hence allowing you to use your phone flawlessly without any trouble. If you are lucky enough then simple cleaning of your display connector and motherboard will be able to resolve your problem, else if you have to go with changing your Sony C6903 display, which will surely be a very costly deal for you.